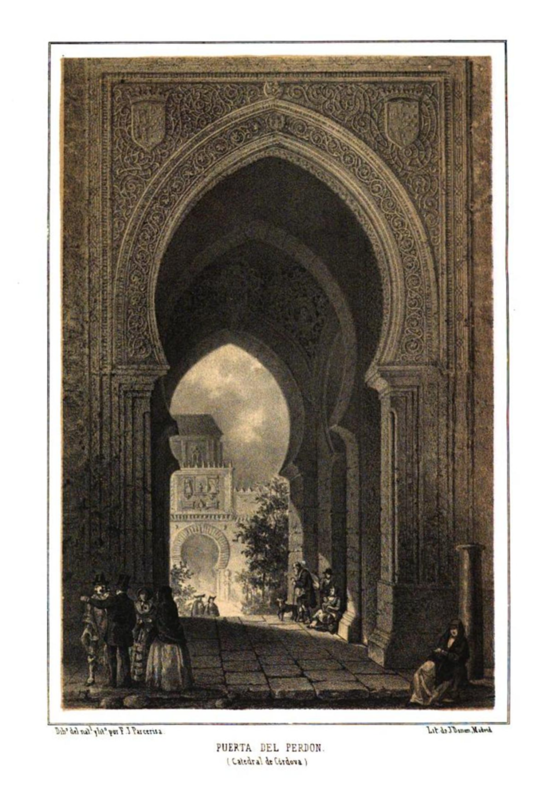 Puerta del Perdón of the Cathedral of Cordoba, former Aljama Mosque. J. Parcerisa engraving (1855). Cordoba is conquered by the troops of the Christian King Fernando III in June 1236. At that time the city would be divided into two distinct sectors: the Medina, which will be known as “La Villa” – and the Axerquia or Ajerquia. Both surrounded by two walled walls and connected to each other through different doors and gates. 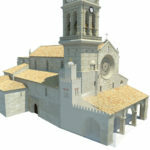 Three-dimensional reconstruction of the Ferdinand church of San Lorenzo with the superimposition of the minaret of the previous mosque, currently preserved inside (AST). After the Castilian conquest, the main Mosque is used and consecrated to Christianity, like other ancient centers of Islamic worship in the city. The site occupied by the old Alcazar of Andalusia is divided between King Ferdinand III, the bishop, some nobles and the Order of Calatrava. Traditionally it has been considered that the current Christian Alcazar is a homogeneous work, result of the initiative of Alfonso XI in 1328. However, archaeology has shown that a good part of its layout is inherited from the Almohad period, and that its subsequent modification does not respond to a single constructive impulse, but is a consequence of the constant contribution of reforms and extensions. Much of the urban planning of the Almohad city is maintained in the Christian city. The walls preserve in essence the same layout, especially the Villa. The main streets are preserved, and continue crossing the city from East to West and from North to South, connecting the most important doors; however, many of the secondary streets will lose part of their intricate previous morphology, as they widen or disappear due to the assimilation of properties, often causing small squares at the confluence of several of these streets (hillocks). The purely Christian urbanism will be developed in the areas of the city that until now had remained virtually deserted, as in the strip of land located in the Ajerquia that runs parallel to the eastern wall of the wall of the town, in the area of the Alcazar Viejo (today Barrio de San Basilio), or in other parts of the interior of the city that until that time had remained dedicated to orchards or corral, such as the sector North of the Axerquia, through which ran a stream intramuros (Guadalcolodro) that complicated its habitability. The first map of Cordoba with the different Lower Medieval parishes (from Garcia, Gamiz 2010). The city is initially organized in fourteen collations, seven in the Village and seven in the Axerquia, each of them presided over by a parish that gives it its name: Santa Marina, San Lorenzo, Santiago, Sta. Maria, etc. A lower unit within them are the neighbourhoods, in which people are sometimes grouped according to the trade they exercise, as there are establishments destined for a specific purpose or because of the ethnic and / or religious characteristics of their inhabitants (Juderia, Moreria, etc.). The current toponymy of Cordoba still conserves many of these references (streets of Farrier, Strainer, Biolermakers, Spice Rangers, Weapons, etc.). 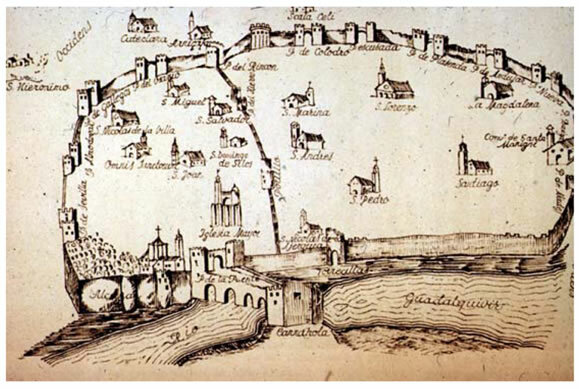 The trades that needed a greater use of water were concentrated closer to the river, detecting in the area of ​​the riverside streets with the names of Badanas, Tundidores, Noques … In this part of the city, which is also an axis of passage very frequented by merchants, there are also numerous inns and inns, where the mancebia district also settled. Another fact of relevance is the creation of numerous hospitals and health care centers of different types, such as asylums and houses destined to shelter the poor, children and even demented people. Late medieval Collaciones indicated in the Plano de los Franceses of 1811 (ESCOBAR 1989). Cemeteries are linked to these churches, sometimes also reflected in toponymy; like the street Cemetery, located next to the Church of the Magdalena, or the Paseo de los Amortajados, next to the current Church of the San Rafael Oath. The walls are repaired and reconstructed during the Late Middle Ages, especially in the Axerquia, as shown by the tower of the Malmuerta, built at the beginning of the 15th century. Nevertheless, the outline and dimensions of the previous Islamic wall are maintained in broad strokes. CORDOBA DE LA LLAVE, Ricardo, MARFIL RUIZ, Pedro (1995a): “Aportaciones al estudio de las murallas medievales de Córdoba. Estructura y técnicas de construcción en el Sector Ronda del Marrubial”, Meridies, 2, pp. 145-177. 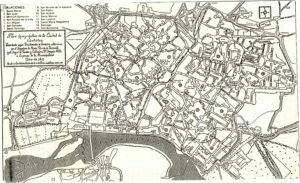 ESCOBAR CAMACHO, J. M. (1989): Córdoba en la Baja Edad Media: Evolución Urbana de la Ciudad. Córdoba. ESCOBAR CAMACHO, J. M.: (2003): “La imagen de una ciudad a fines de la Edad Media: Córdoba en la época del Gran Capitán”, en Córdoba, el Gran Capitán y su época. Córdoba, pp. 17-45. ESCOBAR CAMACHO, J. M. (2006): “De la Córdoba islámica a la cristiana: conquista, repoblación y repartimiento urbano”, en Al-Mulk, 6, pp. 69-94. ESCOBAR CAMACHO, J. M. (2009): “La Córdoba bajomedieval (siglos XIII-XV). El origen de la ciudad cristiana”, en ESCOBAR, J. M.; LÓPEZ ONTIVEROS, A.; RODRÍGUEZ NEILA, J.F. 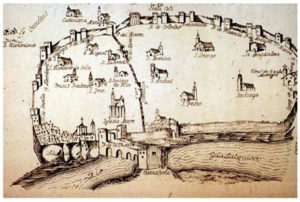 : La Ciudad de Córdoba: origen, consolidación e imagen. Córdoba, pp. 83-131. ESCRIBANO UCELAY, V. (1972): Estudio histórico-artístico del Alcázar de los Reyes Cristianos de Córdoba. Córdoba. GARRIGUET MATA, J. A. y MONTEJO CÓRDOBA, A.J. (1998): “El Alcázar de los Reyes Cristianos de Córdoba” Actas del I Congreso de Castellología Ibérica. Palencia, 345-364. JORDANO BARBUDO, M. A. 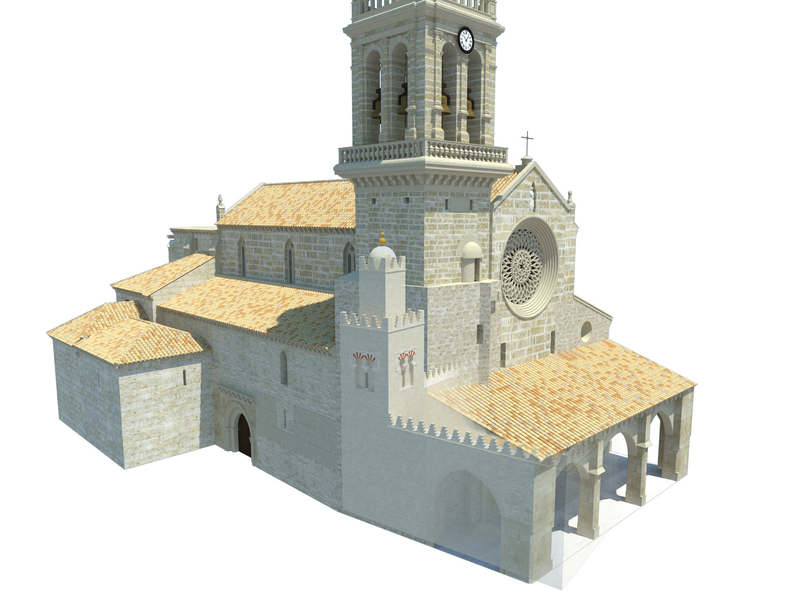 (1996): Arquitectura medieval cristiana en Córdoba: Desde la Reconquista al inicio del Renacimiento, Córdoba. JORDANO BARBUDO, M. A. (2002): El Mudéjar en Córdoba. Córdoba. 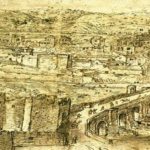 LEÓN, A.; LEÓN, E. y MURILLO, J. F. (2008): “El Guadalquivir y las fortificaciones urbanas de Córdoba”, IV Congreso Internacional sobre fortificaciones: “Las Fortificaciones y el mar”, Alcalá de Guadaira (Sevilla), pp. 261-290. NIETO, M.; LUCA DE TENA, C. (1980): “El Alcázar Viejo, una repoblación cordobesa del siglo XIV”, Axerquía 1, 229-273. SANTOS GENER, S. (1954): “Notas para la historia del Alcázar Nuevo de los Reyes Cristianos de Córdoba” Revista de Archivos, Bibliotecas y Museos 60.2, 579-594.